The homeyness of the Sunflower apartment suite will delight you. Majestic sunrises through the wall of windows in the living area and the French Doors in the bedroom, invite you to wake early while the comfort of your surroundings urge you to sleep in. When you arise at your leisure, the spaciousness of the apartment, including the fully equipped, efficiency kitchen allow you to spread out and feel at home. 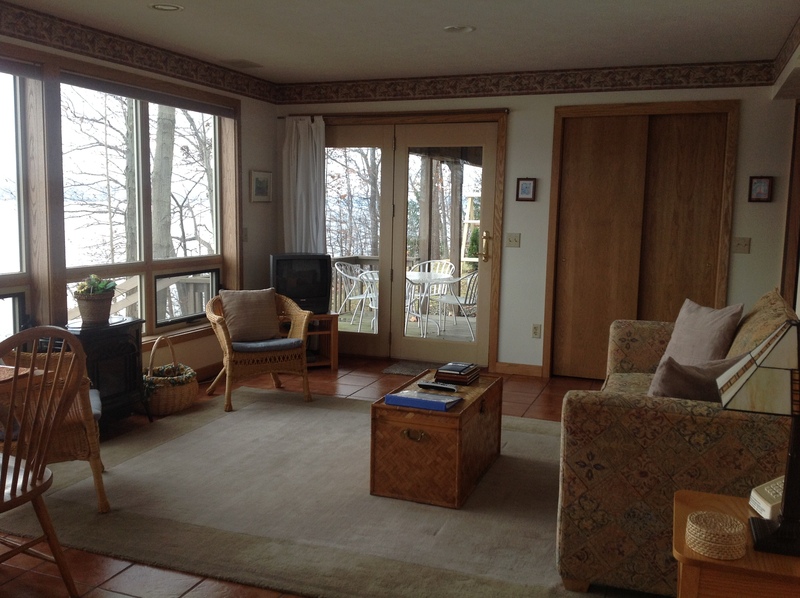 The French Doors open to the private patio and where you can enjoy the light flickering off of Seneca Lake while you enjoy your first cup of coffee or tea. 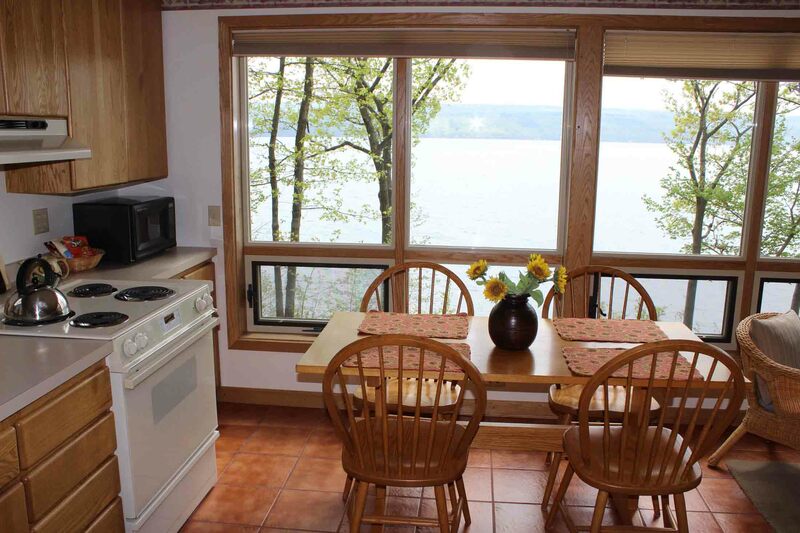 Your patio is also ideal to watch the amazing Seneca Lake moon rise, barbecue your dinner on your own gas grill, or a perfect place to relax any time of day as you enjoy the beauty of the lake. Note – In the Sunflower, the living area which contains the pull out sofa for 1 – 2 people, is separated from the bedroom with a folding door. From both rooms, the bathroom can be accessed without disturbing the privacy of the other room. The Sunflower also has a private, outside entrance, as well as the inside entrance through the main part of the house. Rates for the Vacation Rental Option: 2 nights – $235 plus 4% tax per night, 3 nights – $225 plus 4% tax per night, 4-6 nights – $215 plus 4% tax per night, 7 nights or more – $200 plus 4% tax per night. Rates are based on 2 people. An additional fee of $10 per person per night is added for more than two staying in the rental unit, up to the maximum of 4. Note – if you make your reservation on-line, the amount added for extra people in the apartment may be incorrect and will be corrected manually and a new confirmation sent. Please note the additional 8% savings on the rental option because only 4% tax is charged on the rental rather than the 12% which must be charged on the Bed and Breakfast option. This rental option is without breakfast, and daily housekeeping. For those who desire a prepared breakfast for just a day or two, excellent options exist very close-by. For additional information, call us at 607 243-7548 or see our rental policy. To check availability, click here. NOTE: If our booking engine calendar does not show availability for the option you want for the period you are requesting, we invite you to call 607 243-7548 – there may be some availability not shown and we also have a waiting list. This rental option is without breakfast, and daily housekeeping. For additional information, call us at 607 243-7548 or see our rental policy. 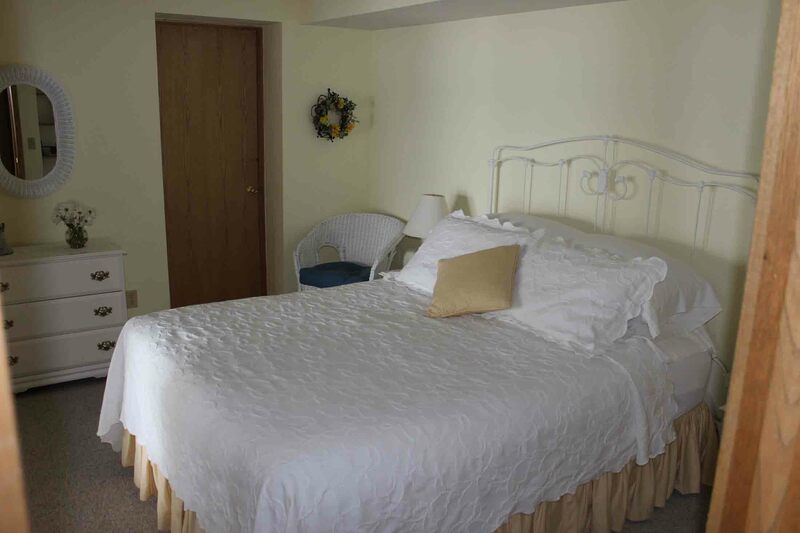 Rate for the traditional Bed and Breakfast Option: $275 per night + 12% taxes for two people (the B&B option includes a full breakfast, and all the other B&B amenities such as homemade cookies and/or other treats in the afternoon, daily housekeeping, etc). There is a $30 charge for each additional person over 2 (with 4 maximum). In appreciation for our returning guests, a $15 discount per night is applied at check-out. There is a 2 night minimum on the Sunflower but exceptions are made when only one night is available. Escape into the casual elegance of Sunrise Landing. Serene woodlands, world-class wineries, and magnificent views of Seneca Lake invite you to make Sunrise Landing your home away from home every time you visit the Finger Lakes.